CHR399. Introduction to Media Ministry is an introductory survey of the theology and practice of media ministry in the local church. The course purpose is to understand and develop a working knowledge of the components of an effective media ministry including visual presentation, audio, lighting, projection, web, and service planning. CHR471 – Youth Topics is a study of the issues facing youth as well as the developmental nature of youth and the issues affecting them and their families, as well as an examination of the demands upon the schedule, priorities, family and other aspects of the youth minister’s life focusing on personal habits, family involvement, calling, career opportunities and continuing development. Prerequisite: CHR369 or permission of instructor. From an early age, God planted a seed in me that I was going to be a teacher. As a youth pastor, I was able to pour into the lives of students and teach them as God had taught me through the youth ministers that impacted my life. My heart’s passion is to dive into the word of God and discover that life transforming truth so applicable to our lives today. I look forward to equipping future generations of pastors who will carry on with the work of taking the gospel to the ends of the earth. 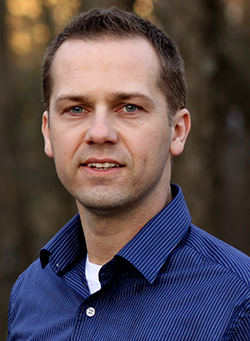 Dr. Sam Totman offers more than 10 years of impactful ministry experience combined with a Doctor of Education (2018) and a Master of Divinity in Christian Education from Southeastern Baptist Theological Seminary (2005) and a Bachelor of Arts in Christian Studies from North Greenville University (1997). His doctoral research was on the Preparedness and Self-Efficacy Perspectives of Youth Ministers Regarding Technology Integration into Ministry. Prior to joining the Clamp Divinity School of Christian Ministry and the Christian Studies faculty at Anderson University, Dr. Totman served as a Centrifuge leader (Union University and North Greenville University), Pastor of Students and Education at Flat Springs Baptist Church (NC), Ministry Associate at Fellowship Community Church (SC), and most recently as the Youth Pastor at East Pickens Baptist Church (SC). He grew up in a family-owned sign company developing skills in design and marketing. After graduating from Southeastern, he started a successful internet business which allowed him to serve as a minister at a local church plant. Since 2011, Sam has served as the Director of External Relations for the College of Christian Studies and Clamp Divinity School. Sam still enjoys filling in for youth pastors and speaking at youth events and special occasions. Sam is married to Amanda, who is also a graduate of the University of South Carolina with a Master of Library and Information Science and North Greenville University with a B.A. in Early Childhood and Elementary Education. She is a media specialist at Belton Elementary School. They have three children, Naomi, Lael, and Miles.